Over the years, I have relied on a few journalists to help me navigate my way through the forces and events that resemble a fog in everyday life, at least in mine. Tom Friedman is one of them. He is probably unsurpassed in terms of scope and depth of knowledge and understanding of countries in the Middle East. I also very much admire his integrative thinking skills. Here is a brief excerpt from a recent column for The New York Times in which he addresses several issues of interest to me. To read the complete article, check out others, and obtain subscription information, please click here. There is a tension at the heart of President Obama’s campaign to confront the Islamic State, and it explains a lot about why he has so much trouble articulating and implementing his strategy. Quite simply, it is the tension between two vital goals — promoting the “soul-searching” that ISIS’s emergence has triggered in the Arab-Muslim world and “searching and destroying” ISIS in its strongholds in Syria and Iraq. Get used to it. This tension is not going away. Obama will have to lead through it. The good news: The rise of the Islamic State, also known and ISIS, is triggering some long overdue, brutally honest, soul-searching by Arabs and Muslims about how such a large, murderous Sunni death cult could have emerged in their midst. Look at a few samples, starting with “The Barbarians Within Our Gates,” written in Politico last week by Hisham Melhem, the Washington bureau chief of Al-Arabiya, the Arabic satellite channel. “With his decision to use force against the violent extremists of the Islamic State, President Obama … is stepping once again — and with understandably great reluctance — into the chaos of an entire civilization that has broken down. Arab civilization, such as we knew it, is all but gone. The Arab world today is more violent, unstable, fragmented and driven by extremism — the extremism of the rulers and those in opposition — than at any time since the collapse of the Ottoman Empire a century ago. The liberal Saudi analyst Turki al-Hamad responded in the London-based Al-Arab newspaper to King Abdullah’s call for Saudi religious leaders to confront ISIS ideology: How can they? al-Hamad asked. They all embrace the same anti-pluralistic, puritanical Wahhabi Sunni ideology that Saudi Arabia diffused, at home and abroad, to the mosques that nurtured ISIS. 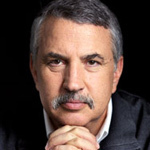 Thomas L. Friedman has been awarded the Pulitzer Prize three times for his work with The New York Times, where he serves as the foreign affairs columnist. Read by everyone from small-business owners to President Obama, Hot, Flat, and Crowded was an international bestseller in hardcover. Friedman is also the author of From Beirut to Jerusalem (1989), The Lexus and the Olive Tree (1999), Longitudes and Attitudes (2002), and The World Is Flat (2005). He lives in Bethesda, Maryland.